This morning I read an exuberant article about the delicious wordsmithing of the songwriters for the old crooners, namely Frank Sinatra. http://www.worldmag.com/2014/08/rhythm_and_rhyme My son Barnabas, whom I just delivered to St. John’s College in Annapolis, gets a kick out of Sinatra. He also enjoys word play and writes engagingly. I shared the link immediately. But his return email to me, hours later, reminded me he is too busy for these unimportant asides. He texted, That looks like a really good article. I’m buckling down this afternoon with a couple of Greeks, so I’ll have to check it out later. 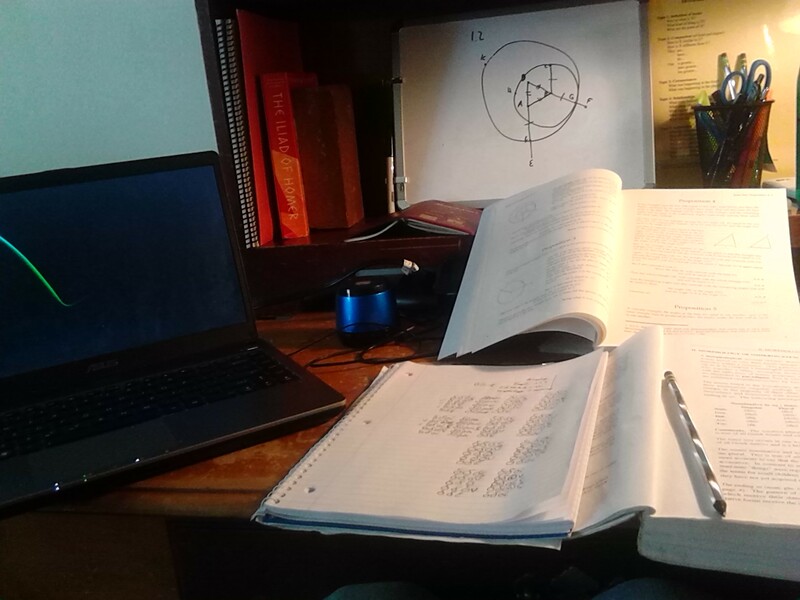 Euclid’s Geometry, Homer’s Iliad, and Greek textbook. Yesterday we had our first talk since I left him there on August 20th. His years with Classical Conversations and the Mandala Fellowship prepared him extraordinarily well for the St. John’s experience. Not only is he familiar with civil discussion, but thanks to his Latin study, Greek is familiar. During his year in the pilot quadrivium program he had plenty of Euclid. He has already read and enjoyed the Iliad on his own, so now he finds it easy to dig deeper. And as for distractions, he realizes there are frequent social events, so he doesn’t worry about losing out while he studies. He focuses on his lessons knowing he can find something to do when he is on top of his work. I was glad to hear it. Am I the only homeschooling mother who thinks she really messed up her kid and ruined him for real life?? I think not! I especially regret how much I didn’t do to restrain Internet distractions. My own productivity and creative efforts have been cramped by all I can or have to do on the Internet. It appears Barnabas has created some internal rules to live by. I feel much better about his ability to handle himself as a man on his own. No small part of that belongs to his classical education, which for Classical Conversations is ultimately about developing virtuous character. I think he is going to make it! Anyway, this homeschooling mother is sleeping better these nights. This entry was posted in classical education, Stories of Home and tagged Barnabas Ashby Holleran, Euclid, Frank Sinatra, homeschooling, Iliad, St. John's, World magazine. Bookmark the permalink.